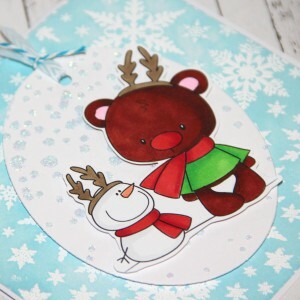 The Card Concept topic is tag, snowman or another wintery theme. 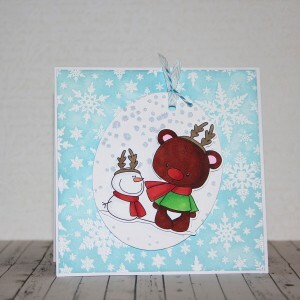 So I made card with cute snowman from Digistamp boutique. It has got three parts. 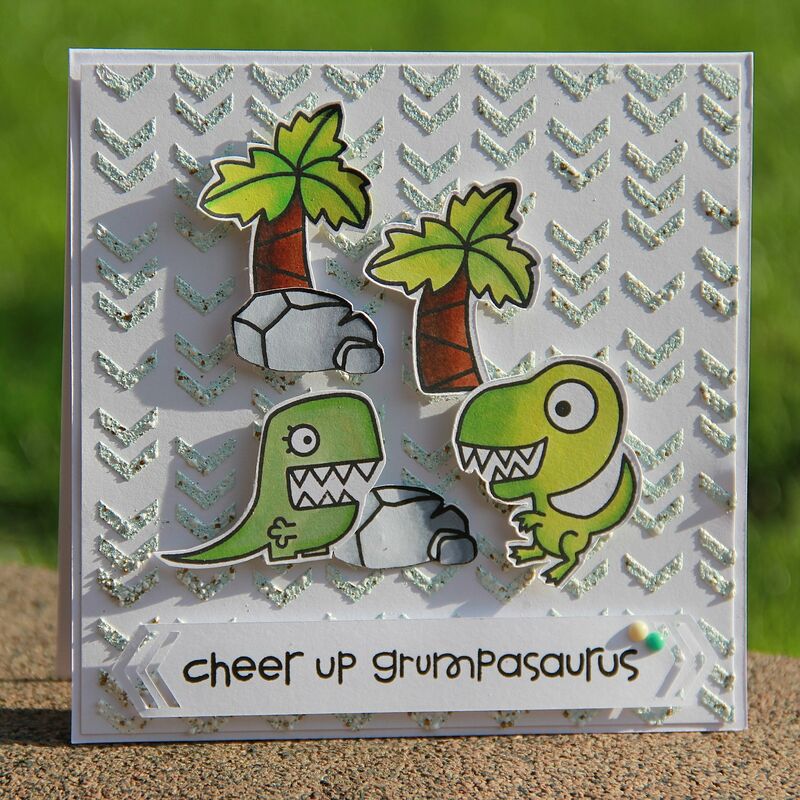 Base of card is made with background stamp which I designed – it is stamped with Versa mark, heat embossed with white embossing ink and than with Salty ocean Distress ink made colour over it. Than I used embossing paste over snowy stencil and before it dried I used glitters from Silhouette. On Big shot I cut oval tag and made hole for ribbon (all ribbons are from May Arts) and last part is digi stamp of cute teddy bear and snowman coloured with Copics, I add some shimmer with Wink of Stela but it is visible naturally not at photo. This entry was posted in Challenge and tagged cardmaking, Challenge, Copic, Distress ink, embossing paste, silhouette, stencil. 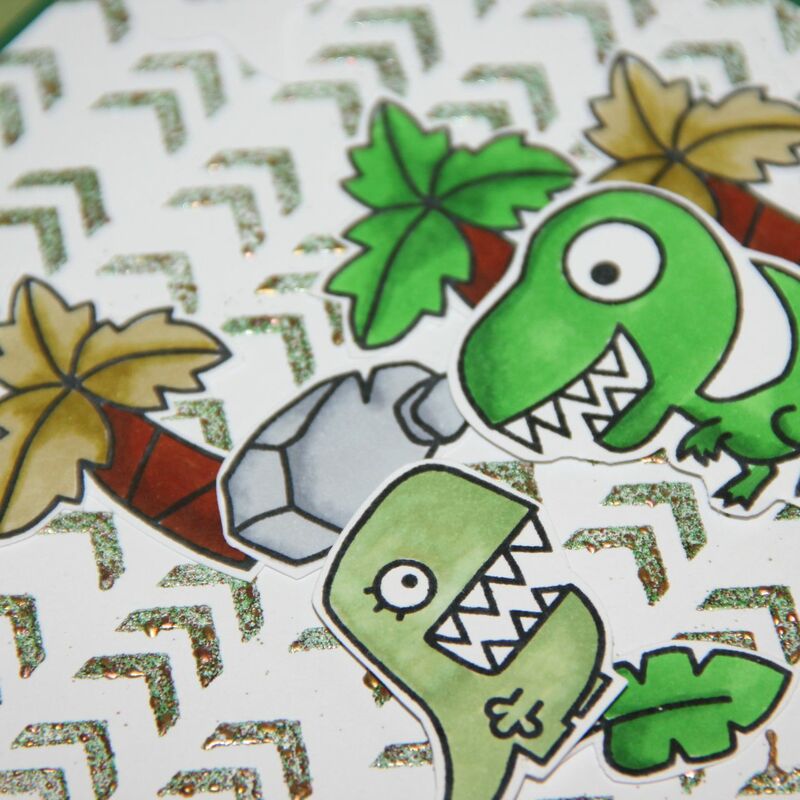 I love Paper Smooches, I do not have still many stamp sets but I have my favourite stamp set with dinosaurs. For challenge I made two cards, this is post number one. This card is made from layers, first is paper with embossed chevrons, I used embossing paste and enamel embossing powder, it made great effect. 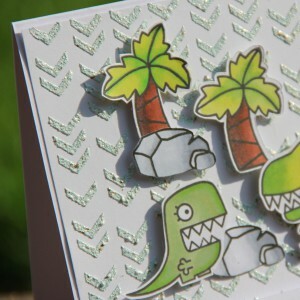 Second layer are trees and stones coloured with Copics and third layer are dinos. Sentiment is above them in bubble. 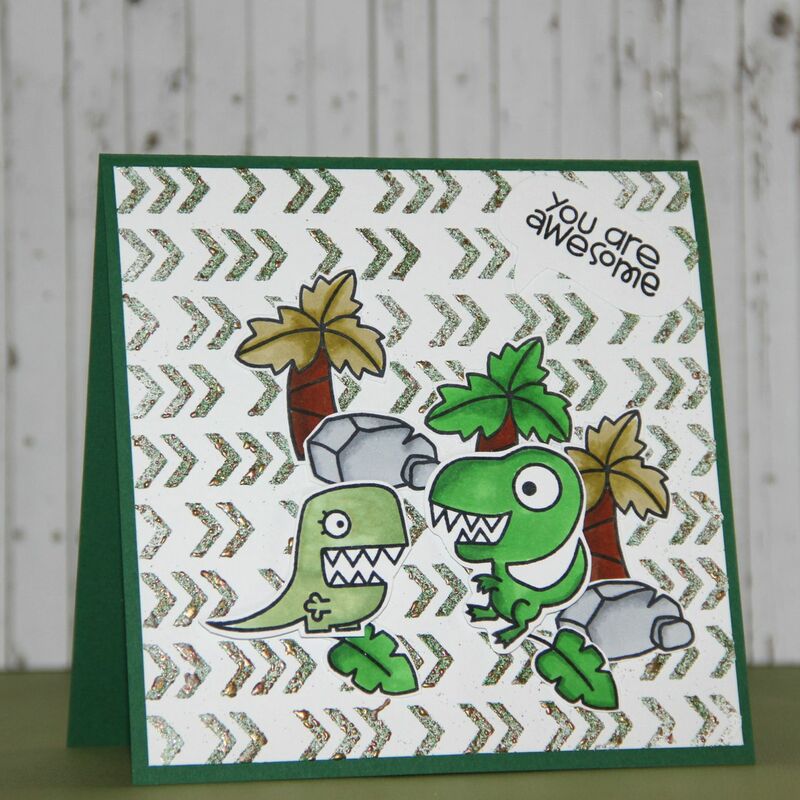 This entry was posted in Challenge and tagged cardmaking, Challenge, Copic, embossing paste, Paper smooches. For fusion card challenge with topic colourful chevron inspiration I decided to make less colours I used chevron stencil, embossing paste and Stampendous shabby blue embossing enamel (it is blue, gold and white) – super powder I love it!. So I made background. 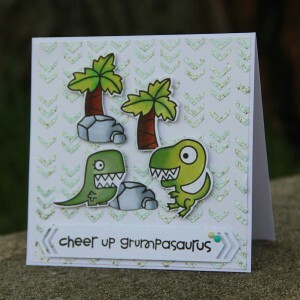 And because I am really addicted to the Paper Smooches dinosaurs stamp I made again another dino card. 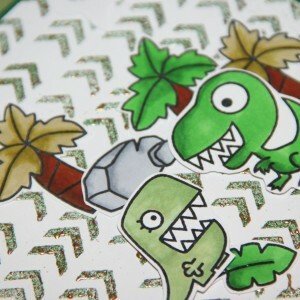 Dinosaurus are coloured with Copics. Sentiment is stamped onto chevron-like banner. 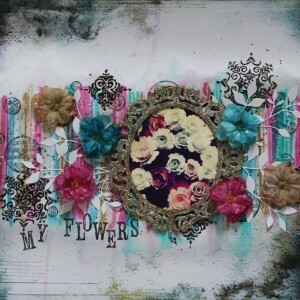 A blog named hero has got topic – layers and I have on my card layers so I decided to add card also to this challenge. 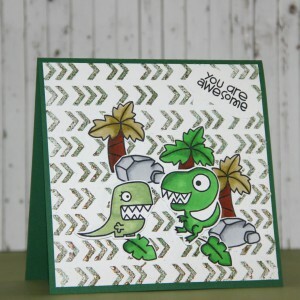 This entry was posted in Challenge and tagged cardmaking, Challenge, Copic, embossing paste, Paper smooches, silhouette. I usually do not mix 2 challenges but I like this card so much, that I am using it in Card concept challenge where topic is umbrella and topic for Simon Says Stamp Wednesday challenge is Clean and Simple. For my card I used stencil with raindrop – for the first time I used embossing paste and embossing powder pearl blue is is very nice pearl light blue colour. It makes together co nice structure. 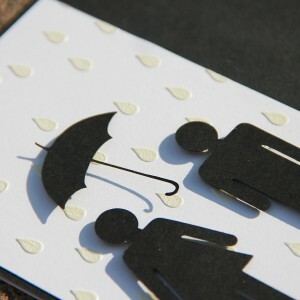 On my Silhouette cameo I cut out silhouettes of boy, girl and umbrella. 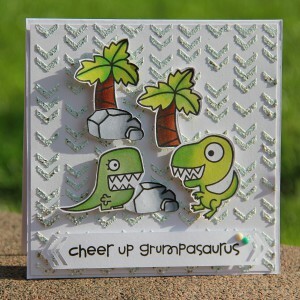 Sentiment is white embossed and it is sentiment from Hero art stamp set. This entry was posted in Challenge and tagged cardmaking, Challenge, embossing paste, Hero Arts, silhouette, stencil.